The exterior of a home has a visual rhythm created by the play of light and shadow. Portsmouth Shake® Cedar Shake can be combined with stone and clapboard to deliver an inviting exterior that can change the pace of a design. 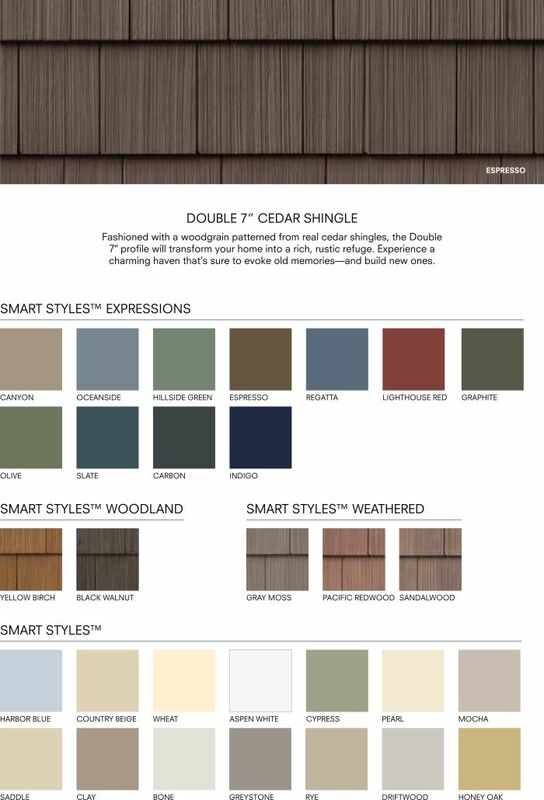 The house on the picture below shows Trim & Windows on Pearl color; Portsmouth Shake® Cedar Shingles in Regatta color and CraneBoard® 7 also in Pearl color. 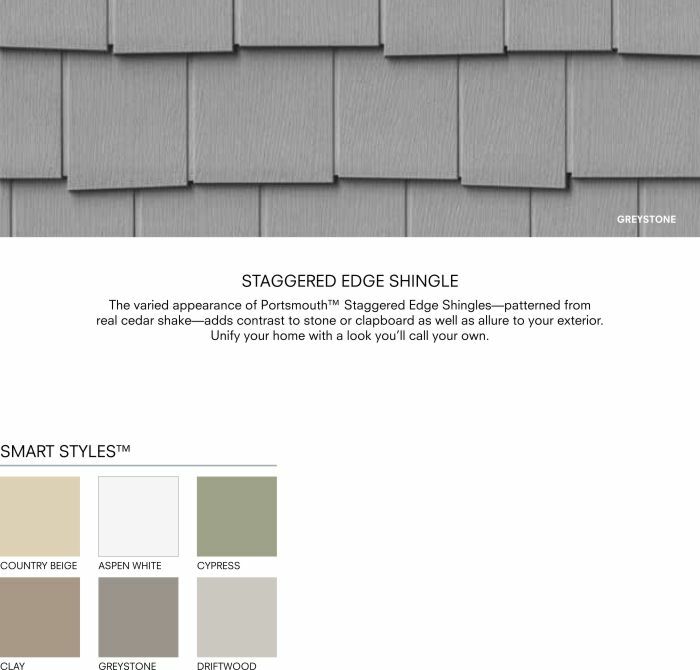 Create unprecedented levels of eye candy with Portsmouth™ Staggered Edge Shingles. Its varied appearance really multitasks—adding dimension, tying gables and other elements into your overall design and providing a dramatic contrast to stone or clapboard. 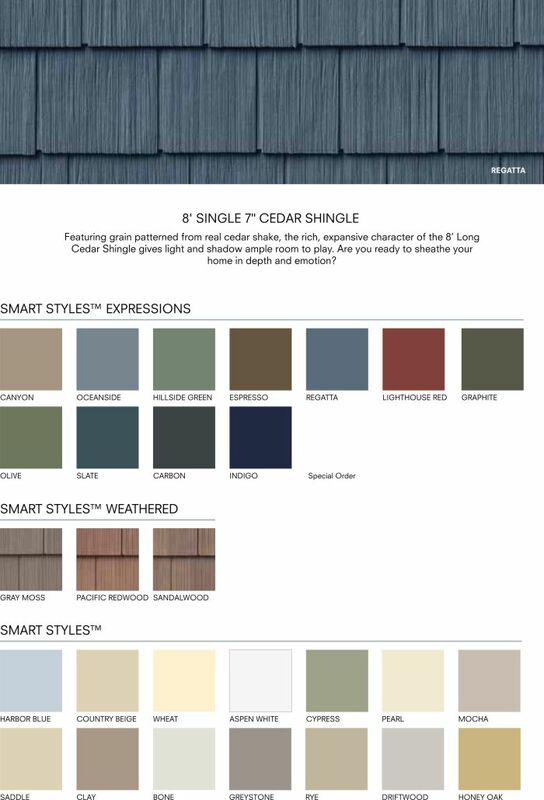 Staggered Edge Shingles adds the richness of real wood to your home while unifying it with a sense of simplicity. The new Weathered Colors – Gray Moss, Pacific Redwood and Sandalwood - simulate rustic, distressed wood without the painstaking work previously needed to achieve such a look. Details can bring balance, order and grace to your home. 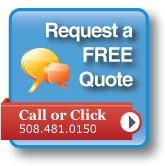 Create unprecedented visual interest with Portsmouth Staggered Shakes. Its varied appearance can add dimension, tie gables and other elements into your overall design, or provide a dramatic contrast to stone or clapboard. Staggered Shake can add impact by endowing your home the richness of real wood or unify it with a sense of simplicity. The house on the picture below shows Portsmouth Shake® Staggered Shake in Clay color. 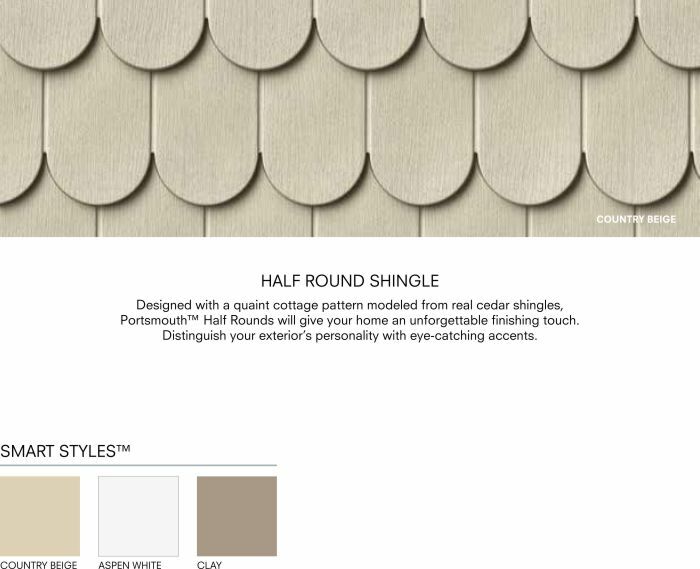 Portsmouth Shake® Half Rounds are distinguishing elements that give the exterior of your home genuine appeal. Use them to add interest to the simplest cottage, or embellish gables for a classic finishing touch to a grand Victorian masterpiece. 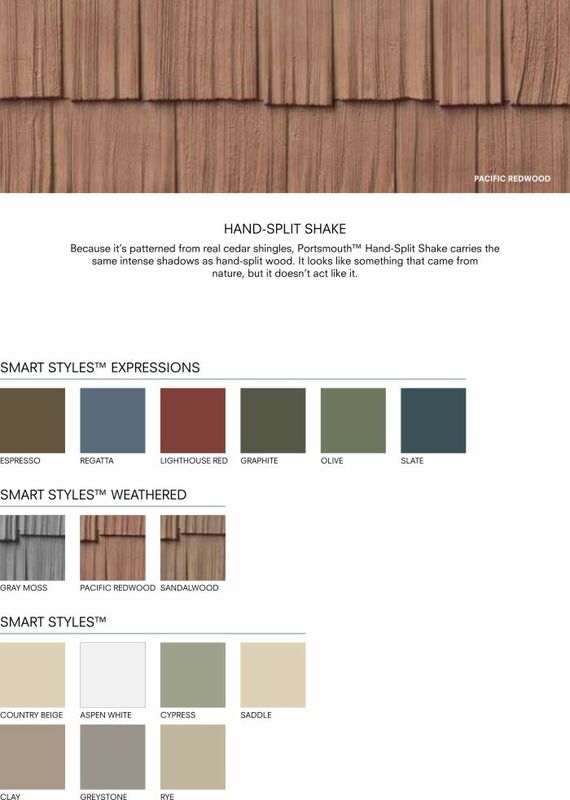 The house on the picture below shows Portsmouth Shake® Half-Round Shake in Cypress color. 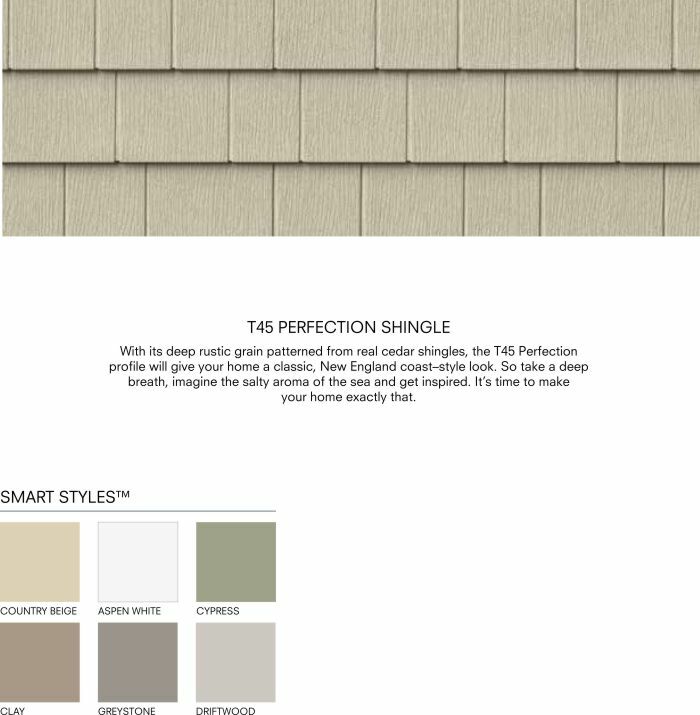 Portsmouth™ T45 Perfection Shingles—with its subtle, natural cedar grain and nicely defined shadow lines—transports your home to the coast of New England without the moving costs, and all kidding aside, without the costly maintenance associated with real wood.